Its no secret that I am a poster boy for disabled people "making lemons out of lemonade." I also know that I am a "cream of cripples," a term used by some within the disabled movement (please email me if you know who invented this term) to describe people with disabilities who are more functional and charasmatic than others who are also disabled. A "Cream of Cripples" is more palatable to media and audiences and has more common ground with the able-bodied. While I do not like being held up as an "example to us all" or being situated as "challenging disability" due to my situation as an artist I cannot control the journalist and writers so caught up in this particular narrative. This is why this reworking of the whatiswhat.com site is so important to me. I will use this space to share the details of my own history and perspectives on the subject of disability on an ongoing basis rather than the static nature of the previous whatiswhat site. 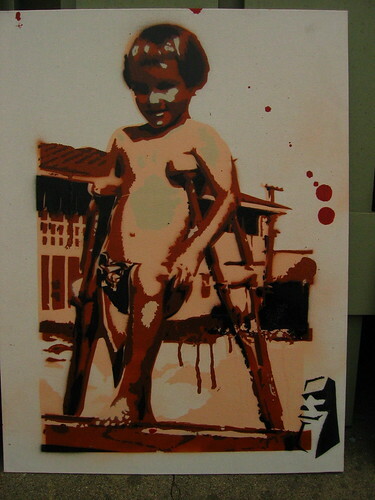 "ART, LIFE AND THE DISABILITY FACTOR"
This is an essay I wrote in 1996 to begin to explain the relationship between my art and my disability throughout my life. Born June 8th 1970 in Nashville Tenn, I was diagnosed with Legg-Calf Perthese disease in 1975. Legg-calf Perthese effects the ball and socket joint development of the hips. I had it bilaterally, first the left then the right. The blood circulation to the bone is dramatically reduced so that the bone does not solidify even as the bones surrounding it do. Thus any pressure in the hip joint crushes the softer bone which is the head of the femur or the ball of the hip. By puberty the effect of Perthese is complete and whatever damage is done is done at that time. The disability I had changed my trajectory in life dramatically. I was the Easter Seals Poster Child of Tennessee at five years old. The poster shows me sitting on a stuffed lion, neatly wrapped in a leather trimmed chunk of steel with perfectly arranged crutches in the foreground. The leather and metal braces were very cumbersome early on and it took me a while to negotiate with them on. When I was in pre-school it was with other disabled kids. I was comfortable there and received a lot of attention and nurturing. My mobility with the crutches and brace steadily improved. When first grade arrived my family moved and I was mainstreamed. Suddenly I was the only person in my whole school with a visible disability.I feel that being mainstreamed had a significant impact on me; There were a lot of situations that came up which were formative. Art took on a greater significance as I settled into my new situation. In retrospect art making did not require teams. Art making leveled the playing fieldî in a way that was impossible in other recreational schoolactivities. When I noticed my own alternative solutions to everyday task such as carrying books while climbing stairs or picking up a cup without bending over I instinctively realized that thinking creatively and looking inwardly for answers was the way for me to survive. I lived in a world with no peers to follow. I believe this type of daily creativity and self reliance cultivated creative problem solving without looking to others for answers. In the last couple of years of the disease's initial spell I took crutch movement to a level very particular to my condition. It was then that I learned the foundation of the crutch movement that I now perform. Keeping up with my younger brother constantly was pushing me into new territory. When I turned eleven the doctor said it was all right for me to walk again. So I did. The transition back into the able bodied world was quick on a visible level. Within a month I could walk normally with only a slight limp to the right and some back curvature. By the end of a year I had some strength in my legs and better poise. In retrospect, I think even my parents couldn't have known how confusing it was to no longer be recognized as disabled. My public persona and private self were worlds apart and I was searching for ways to close the gap. During the time when I was disabled as a child I would imagine burning all my crutches and braces and jumping around the fire I had created. The reality of being done was another big change in life that I had to adjust to. I was happy but also at a loss to define the other feelings I was having. Specifically, the greatest test was the redefinition of my public identity. Again, as in the past, art was the place that I went to... a safe place where creativity brought the answer without having to ask the question. Two creative activities I became involved in from 1984 - 1988 eventually contributed to the development of my particular dance form. Those activities were breakdancing and skateboarding. The experiences I had as a breaker and a skater intersected with my disability and brought back to me in unexpected ways on physical and psychological levels. I knew I could not take a fall like the others so I was hesitant to be a daredevil but made up for this shortfall by developing a highly refined low impact mellow type of flow style. Still i did try some of th ejumping and suspect that my accelerated degenerative condition especially in my right hip was due to being young and stupid. see image of japan air 1989. makes me cringe to look at it now. 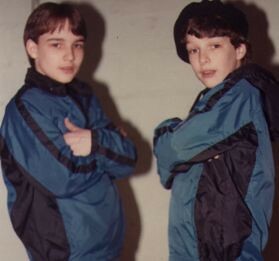 When I first started breakdancing the more acrobatic moves were very difficult because of my lack of strength in my legs but I compensated for this as well by relying on my style and became more of a popper with a heavy puppet style and wave style which were interchangeable on the fly. While breakdancing and skateboarding taught me how to express myself physically with both power and grace it also taught me that my disability was a lifelong presence and that I would always be modifying my actions to fit its parameters. From age eleven to age twenty three I lived with the appearance of an able-bodied person and functioned without any visible difference in most situations. Pain was surprising during these years more so than it is now as a constant hum with peaks and valleys. Some instances during this time where the disability came to surface was in high school I refused to run laps and explained about my disability to the teacher. The teacher said fine with him. Later in the year I was playing basketball and jumping and the teacher walked up to me and said you seem fine to me and then he failed me. I was too unconcerned to challenge him at the time though now I wouldn't allow him to make such judgments about me based on how and when I decide to use my hips. 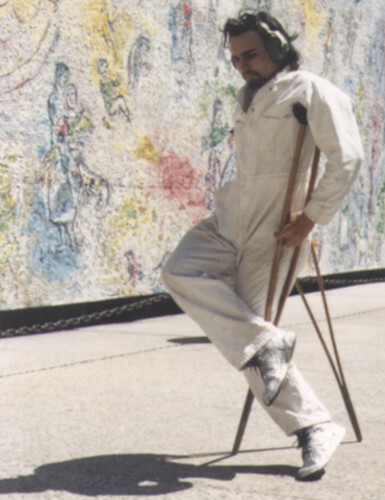 I also addressed my history of disability in my work and in 1991 performed on-stage with crutches for the first time. This was before I used them for mobility. In that performance I walked on them for a few minutes after emerging from an egg type wrapping signifying birth. I was performing my history before going into the improv of the present. In 1993 - 94 when my disability began to reemerge and I began having increased hip pain and my fingers ached and cracked a lot.I started thinking more about my diet and how much activity I was doing. I went to the doctor after a severe bout of pain where I was basically laid out on the floor writhing. This was not like a stretched muscle but a bone pain. I was told I would need to begin to use a cane to get around and was prescribed pain killers. I had to stop putting unnecessary pressure on my hips or suffer; My knees were aching too. I used a cane for approximately a year but it was in the way more than helpful. When my hip or hips really hurt a lot the cane didn't do much when I was not hurting much but wanted to prevent pain it didn't really help either. Eventually I adopted crutches. I was familiar with them and they were better than canes because they freed up my hands so when I needed to reach for something I could hold with my armpits. In no time I was back to my old school crutch skills. Rather than one hundred percent weight on my legs I was now weight sharing with my arms which significantly increased my ability to walk distances. Eventually I reconnected with skateboarding in conjunction with my resurfaced hip condition. This merger was a dramatic improvement over walking as it allowed me to stand on wood rather than cement while traveling in the city and I could keep my hips relatively still if I was hurting badly. While skating on crutches could not return me to my days of skating without them this new use of the skateboard opened up new possibilities in terms of maneuvers and weight distribution. I also began re-exploring breakdancing on my crutches and was able to express myself acrobatically more on crutches than off whereas the style of the breaking was carried over and merged with the technique of crutch handling. The use of crutches to alleviate hip pain was also a lifestyle choice in the sense that I could with some sort of health insurance have a hip replacement operation. The fact that my mother has worked in an operating room for over twenty years and my dad is a metallurgist has allowed me to have an inside track on the very latest information on surgical procedures for the hip and the materials that are used for the implant. The technology keeps improving year after year but to date the most reliable solution according to leading hip specialist remains fusion. Implants just don't last and once done cannot be reversed. I also notice that if I don't move for several days when I do try and move again I am very stiff so even though it hurts I try and move to keep the joint alive. Currently I use crutches on a daily basis and a skateboard for any distance over a block. I walk without crutches in my home for short distances. I dont carry anything heavy without putting it on a skateboard and rolling it or sitting down while moving it. I cant run or jump or walk any distance without paying for it with pain in the hips that when ignored can comletely immobilize me. It is also important to mention that the significance of keeping the joint alive by using it in spite of the pain is an important part of my dancing and skating to this day. If I dont use it I will definitely lose it. This is happening already in that I am driving more and notice that my hip will freeze up and not want to straighten out completely without a full warming up. This story is not over yet.